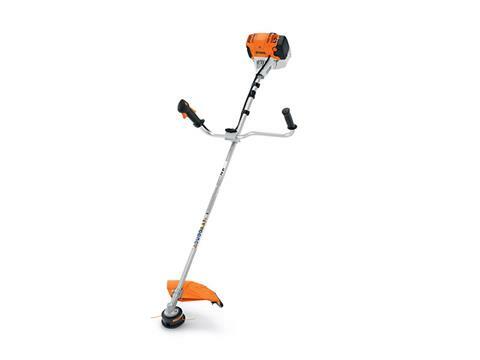 If you’re a landscaping professional who uses their trimmer for mowing applications, grab the powerful STIHL FS 91 trimmer. Its bike-handle design adds greater comfort and leverage, thanks to its redesigned rubberized grips. The trimmer also features one touch stop and a simplified starting procedure enabled by the semi-automatic choke lever. Its low-emission engine is paired with a larger fuel tank, delivering 30% longer run times when compared to the FS 90. The engine also includes improved air filtration and STIHL exclusive IntelliCarb™ technology for maximum RPM. And when the terrain gets tough, this trimmer’s solid steel drive shaft accepts a wide range of heavy-duty cutting heads, including metal blades, for maximum versatility. BIKE HANDLE: When used in conjunction with a harness, the bike handle allows the machine to be easily guided, enabling a smooth horizontal mowing action to cover large areas quickly and efficiently. With soft grips for increased comfort, the bike handle provides greater control and helps reduce operator fatigue. TOOL-FREE HANDLE ADJUSTMENT: The central wing nut enables easy adjustment without the use of tools. For transportation and space-saving storage, the handle can be rotated 90°. CUTTING HEADS & BLADES SELECTION CHART: Need help selecting a cutting head or blade for your STIHL trimmer or brushcutter? *STIHL trimmers, brushcutters and lawn edgers have many common features. However, all models may not have all the features shown here. 12.8 lb. (5.8 kg) - Without deflector and cutting attachment.